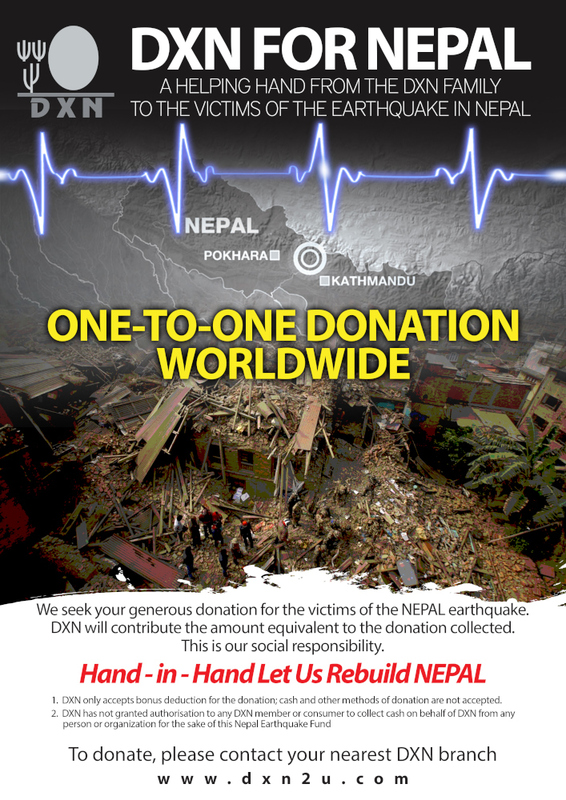 DXN for Nepal – a helping hand from the DXN Family to the victims of the earthquake in Nepal. On 25th April 2015, we were all hit with the devastating news of a 7.8 magnitude earthquake in Nepal. Within a few short days, the death toll in Nepal has risen to more than a few thousand victims. It is considered one of the worst earthquakes of this decade with many left destitute. Century-old buildings have crumbled. People have lost their homes and livelihood. Many are struggling without basic necessities like food, water, medication and shelter. In addition, relief and rescue efforts are hampered due to powerful aftershocks. We, at DXN, are deeply saddened by the plight of our Nepalese brothers and sisters and we would like to do what we can to help them. We know we are not alone in this sentiment and that all of our DXN leaders around the world in Asia, America, Europe and Africa feel the same as us. Many of our leaders have families in Nepal and as one DXN Family, we need to stand by them at their hour of need. Most of us are unable to go there and help with the rescue efforts of many still trapped under the rubble or provide the medical care they desperately need but we can help through monetary means. The financial assistance we give them will aid in the purchase of food, drinks, medication and basic necessities that they need to get by, and it will also help them to rebuild their lives. Our DXN philosophy has always been to help one another, hence we would like to seek your goodwill to donate generously to the DXN Nepal Earthquake Fund. DXN promises to meet your charitable donation by contributing the same equivalent amount of what you have donated to this fund. Those who would like to make their donation may do so by completing this form and submitting the completed form to your local DXN Branch or main stockist. Let our thoughts and prayers be with our Nepalese brothers and sisters and those involved in the relief efforts while we give generously from our hearts. If you decide to donate by deduction of your May bonus 2015, form to fill in. Please fill in this form and signed send back to your nearest branch. We believe, you feel the same way, that each donation, even if it was 1 Euro can help the area the most affected. DXN will contribute the same equivalent amount of what every members have donated to this fund. Thank you very much for your good will to help those, who need it the most. Once again the form DOWNLOAD from here. Fill it out and send back to your local DXN Branch. We already did this.